Play it at the Natsume Atari booth at Tokyo Game Show 2018. Taito’s July-announced, tentatively titled Ninja Warriors Again for Switch will be officially titled The Ninja Warriors: Once Again and launch worldwide in 2019, the company announced. 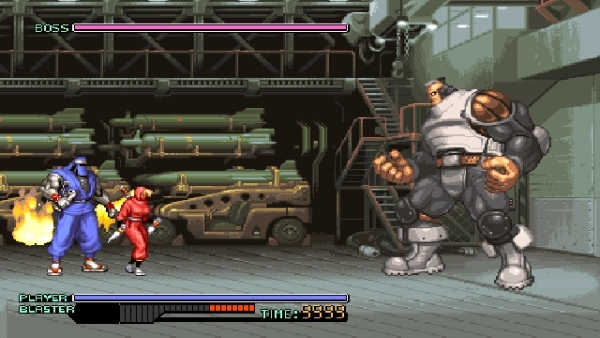 The Ninja Warriors: Once Again is a port based on the 1994-released console game The Ninja Warriors Again (which is a remake of the 1987-released arcade game The Ninja Warriors), but with the addition of new elements including updated graphics, 16:9 screen support, new characters Yaksha and Raiden, and local two-player co-op support. The game will be playable at the Indie Game Corner Natsume Atari booth at Tokyo Game Show 2018 from September 20 to 23. Players can choose from playable characters Kunoichi, Ninja, and Kamaitachi, and play until they clear the stage.